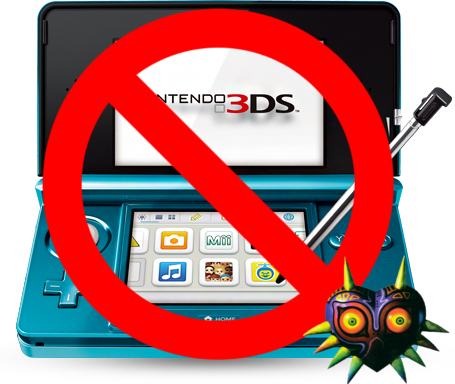 Majora’s Mask 3D will NOT be compatible on old 3DS models. Great business decision on the part of Nintendo: to screw over the install base like this. 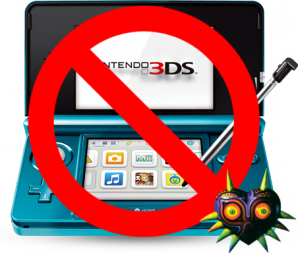 Nintendo announced this morning that the 3DS family of handheld systems is expecting a new member. Named the New Nintendo 3DS, this new system has more computing power, longer battery life, and even tracks the player’s face so the 3D effects can be seen from an angle. They also announced that some games will be exclusive to this new platform. In conjunction with Shulk’s public reveal for the new Super Smash Brothers games, Xenoblade Chronicles was the first name thrown out. However, after the presentation, VEAG’s own correspondent Lord Pitaya was informed by Nintendo of America’s own marketing manager Bill Trinen that a new game, The Legend of Zelda: Majora’s Mask 3D, will also be joining this exclusive line-up. “That’s kind of a bad excuse, don’t you think?” Lord Pitaya asks him, curiously. Lord Pitaya then laughed softly at this last comment as he was sipping his wildberry tea, before being met with a stern glare from Trinen, who called for a conclusion to the short-lived interview.